How might we build resiliency between the disconnected urban individuals? How can we build empathy between the strangers, and eventually, how can communities have resiliency in a disaster situation? Act-No-React is a street intervention for stimulating connections between strangers in the urban environment. Humans are weak in front of big disaster situations. The disaster itself might be inevitable; the reaction could be different. To examine the real disaster situation, my classmates visited Breezy Point, NY to hear the actual human stories happened with the Hurricane Sandy in 2012. According to the book Unthinkable by Amanda Ripley, people are willing to help each other in a disaster situation. On the other hand, they don’t care others in normal lives, and usually, it’s easy to see this cold attitude in the big cities like NYC. What makes this differences? Do we need to wait until a disaster happens to see people’s kind behavior? My class held a workshop with members of Red Cross and FEMA to share the thoughts about resiliency and to find out the possible ideas. My team set the goal of resiliency and continuously asked how. 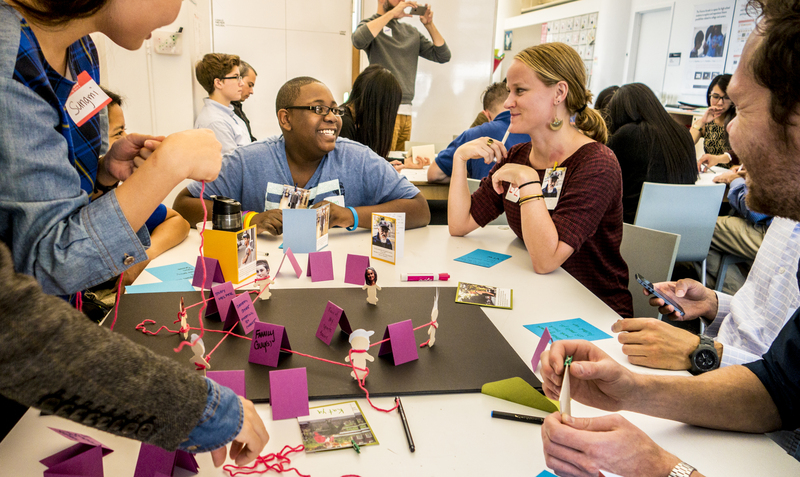 “How can we build resiliency? Information acquisition might build resiliency.” “Then how can we acquire information?” “Connection between people might help to obtain information.” “How can we connect people?” “Empathy might connect people.” “How can we bring empathy between people?” “Be vulnerable. Then people might have empathy.” This framework helped us to dig into the core of resiliency and to build workshop structure. Since the goal of the workshop was resiliency building, we started exposing vulnerability between strangers. To read detail about the workshop, click here. Under the goal of “How can we build strong communities? And what can we do?”, my team planned a workshop. To easily attach to each persona, we selected eight people from Humans of New York. We took the people’s photos and quotes because the quotes tell a lot about the individual’s life and personality although they are short. Also, they could bring real empathy because they are real humans who live in New York. 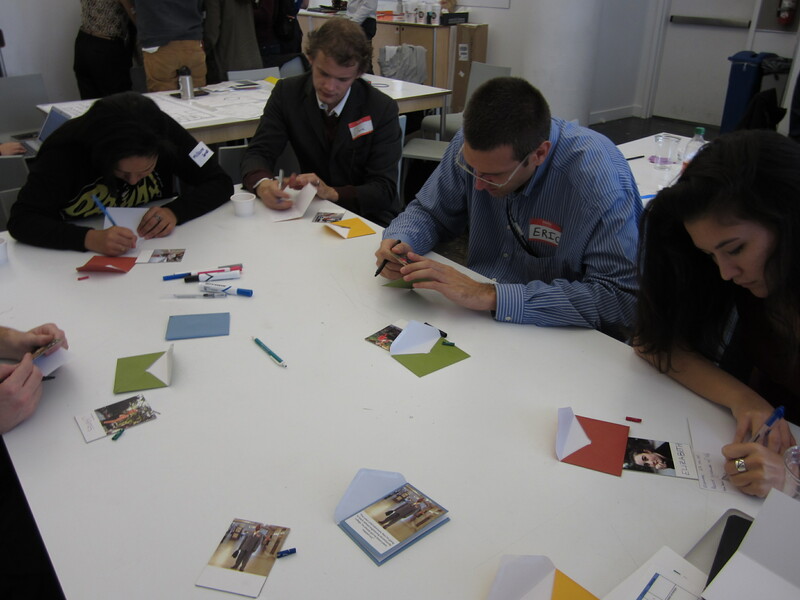 Participants are writing down the person’s profile and stories in an each card. At this moment, the group of participants rotated the tables. The second group read the profiles in the cards that the first group built and tried to find connections between personas. The third group came to the table, were told to create possible scenarios based on persona and connection points. It wasn’t easy because they had to absorb everything that previous participants worked and ideated new opportunities on other’s ideas. In prototyping phase, each table divided members into two groups. Based on the scenarios, facilitators brought the two “How might we” questions to prototype. Q. How might we leverage local skills & relationships with the goal of building community resiliency and connections? 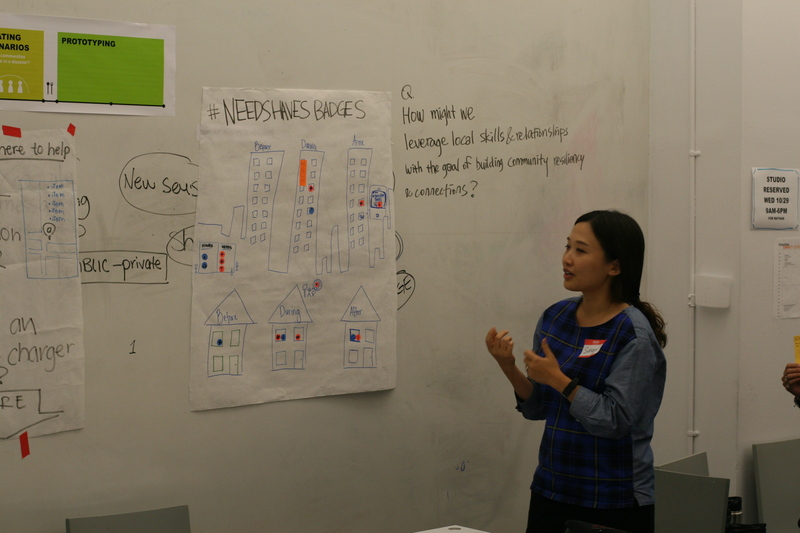 my team created a service named Needs-Haves Badges, which is a skill-needs badge system in neighborhood scale. Based on insights from the workshop, we set a new hypothesis and prototyped our ideas. Hypothesis 1. If there’s a reward in public spaces, people might start to connect each other. Only one couple are connected at last. To simulate the coffee shop situations, we created a free coffee event at school lobby. We distributed free coffee and a half side of postcards. Then we asked participants to leave contact for another postcard holder to get an extra free cupcake. 10 people participated. Reward is temporary. 11 coffee was distributed. People care their personal issue first. 2 people got cupcakes. People don’t like to leave contacts. 2 people answered survey. Peer pressure can help connections. Behavior change is hard without rewards. The results brought up next questions to us. How can we overcome awkwardness? How can we encourage generosity? Hypothesis 2. If we create an exceptional experience, people might participate without reward. Based on insights, we designed experiences as a catalyst to connect people instead of giving physical rewards to people. One of the biggest challenges was awkwardness, so we tried to make the experiences in an enjoyable way. How? We designed a Talk Relay Card and went out to public spaces, Grand Central Terminal, Rockefeller Center, and Times Square. We approached random people, said beautiful message, and passed the card. The first attempt was so hard for us because of shyness and awkwardness, but it brought a great feeling once we tried. We couldn’t measure how far the card went to, but we were sure that this type of experiences could bring happiness. We tried three types of Relay Card-“Good morning”, “High Five”, and “hug”- as our final iteration. We spread the card in popular public spaces in NYC to strangers. The most playful and easiest one was the High Five Relay Card. Obviously, the Hug Relay Card was most difficult one, but through multiple iterations, we also found that “Can you give me a hug?” was better than “Can I give you a hug?”. Through this project, what we learned is that a small everyday approach can make a significant impact.Also, sharing fun experiences with strangers can be a meaningful and memorable ways, and eventually we can expect resiliency in an urban environment.